When the dedication for the opening credits of the 1939 MGM classic “The Wizard of Oz” was written, no one could have imagined the lasting impact the movie would have on American culture. Or how accurate the assertion that “time” would be powerless to stop the story was going to be. A treasured film, the infiltration of “The Wizard of Oz” into American culture is undeniable and virtually unparalleled. From an international fan club that is over a half-century old and boasts over one thousand members, to the nearly one thousand documented references to “The Wizard of Oz,” its constant reemergence in culture and entertainment is overwhelming. Quotes and references from “The Wizard of Oz” can be found in movies, music and sitcoms and no genre is left out. Everything from “Star Wars” and “Clueless” to “The Simpsons,” “Hannah Montana” and “The O’Reilly Factor,” pay tribute in reference to the beloved classic. In music, Pink Floyd, Madonna and Metallica have alluded to L. Frank Baum’s story. And in everyday life, who doesn’t know a Wicked Witch of the West or every now and then want to simply click their heels three times to get home? The national touring production of “The Wizard of Oz” is a spectacular celebration of that classic 1939 MGM film. It’s a new, refreshed and lavish rendition of the beloved classic. Audiences young and old, seeing it for the first time or the fifth, will be dazzled by the brightly colored sets, charmed by its timeless score and enthralled with its breathtaking special effects. It truly is a wonderful show for the whole family. 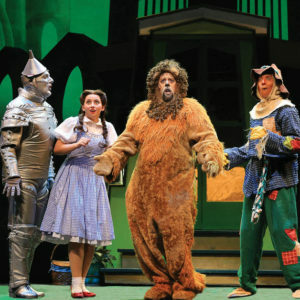 And whether it creates new memories or conjures them up from the past, everyone deserves to experience the wonderful, whimsical and enduring story of “The Wizard of Oz,” coming to The Hanover Theatre and Conservatory for the Performing Arts November 8-11.